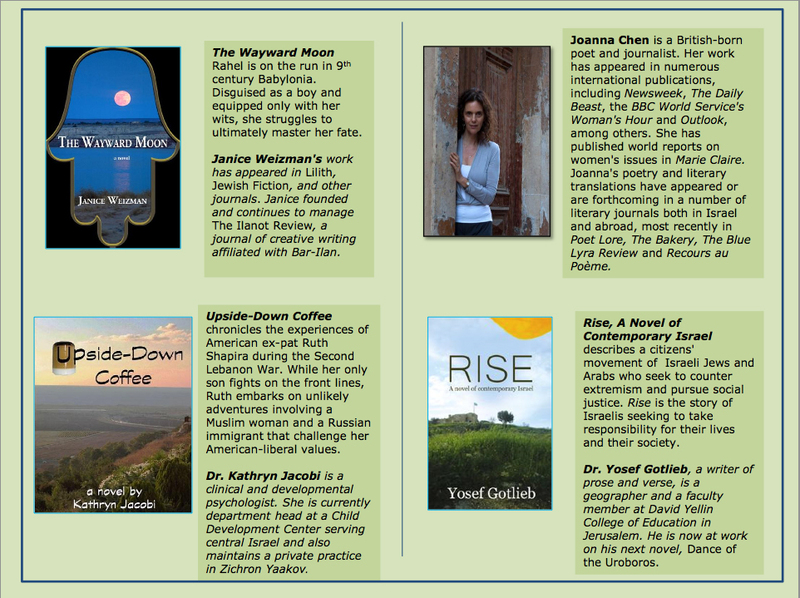 Hadassa Tal’s poetry in my translation in Waxwing. Music to follow, I promise. Three poems of mine in A World Assembly of Poets. Read about it here in The Huffington Post. Five poems in my translation by Yonatan Berg in Poetry International. Two poems in my translation by Michaela Lamdan from Hebrew in Lunch Ticket. Two poems in my translation by Nasser Rabah from Arabic and Yonatan Berg from Hebrew in Consequence. 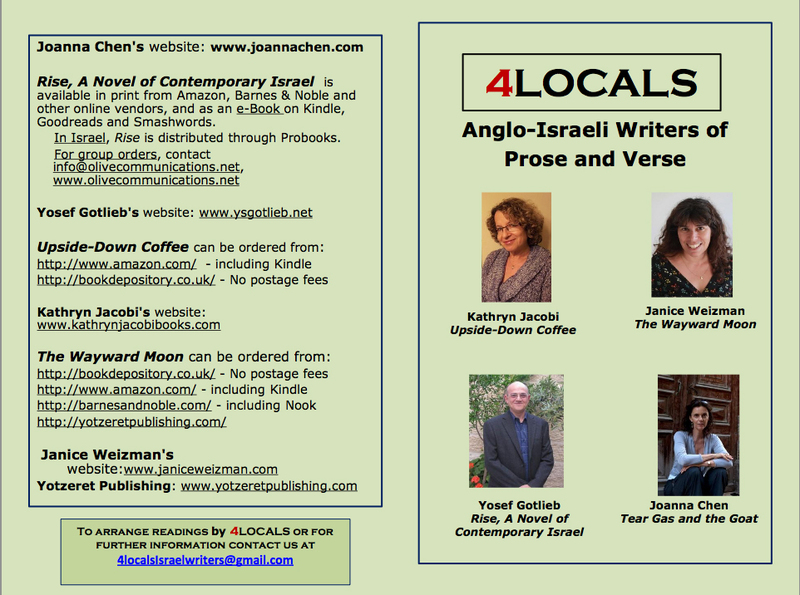 Two poems in my translation by Nasser Rabah from Arabic and Yonatan Berg from Hebrew in Oomph Anthology. After a Night in the Alley of Worshippers in Lunch Ticket. Two poems by Israeli poet Yonatan Berg in my translation. A Beginner’s Guide to Tear Gas in the very beautiful Wild Age Press. Careful not to choke on it. Transatlantic Poetry hosted by Rachel Heimowitz. Yonatan Berg reads some cracking poetry, translated by me with love. A Strange Vitality in Radar Poetry. With a beautiful illustration by Tayfun Gulnar. A podcast by Marcela Sulak on the poetry of Agi Mishol, with my translations, on TLV1. Listen and love. The wonderful journal, Recours au Poeme, has published four of my poems in French, translated by Marilyne Bertoncini. This is a weekly on-line journal with great writing from all over the world. Try it, you’ll like it. Merci beaucoup! Come and celebrate the launching of the fabulous Ilanot Review this Saturday, January 19, 2013 at 8PM at The Dancing Camel in Tel Aviv. I’ll be there, along with Sarah Wetzel, genius poetry editor, Marcela Sulak, Annie Kantar, Judy Labensohn and a host of other fine writers. or as if I were an engine bathing itself in oil. that I am someone who knows how to handle a sword, as well as a bow. that I will honor your warrior stance as well. poetry’s Big Bang can lave any warrior’s tongue. A great honor to be part of a group of translators showcased in The Bakery, a wonderful literary journal. Here are my translations of Agi Mishol, taken from her latest book, Working Order. And here are three of my own poems in this same issue. Please check out also the great work of Marcela Sulak, Dara Barnat and Jane Medved. you do not know me either. lying down better than sleeping.